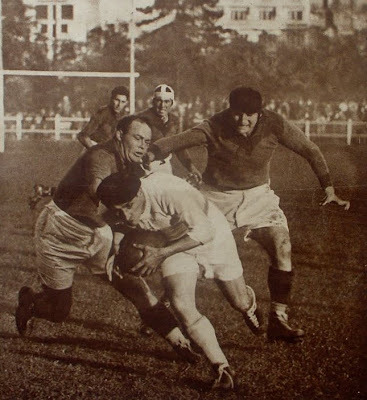 Sticking to something of an historical theme, while googling for interesting rugby images I came across this photo of an encounter between two French clubs (featuring a player sporting a beret) dating back to the early 1930s, just one image from a fabulous collection of images and other rugby memorabilia to be found at rugby-pioneers.blogs.com . The site is the brainchild of Frederic Humbert, a collector fascinated by the early days of rugby (between 1870 and the 1930s) and who has built up a superb collection of memorabilia, much of which is displayed on the site. The odd thing is that I've known about and admired rugby-pioneers.blogs.com for some time now and had assumed that I had included a link to it from this blog. It came as a big surprise to me to discover that I had omitted to include such a link - something I can now put right. For rugby geeks like yours truly there are hours of fascination to be had at this site. 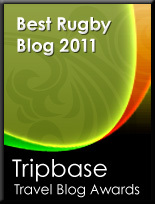 I recommend, however, that you do not access rugby-pioneers.blogs.com from your computer at work - not unless you are prepared to be entirely unproductive. Keep up the good work Frederic! Heh, I had the same problem! I've known about Frederic's site for about a year and I only recently had a chance to post it up. He's an amazing dude. Flanker, this is utterly fantastic. What a great link! Great photo! Gotta love playing rugby with "Le beret Basque"...was this player just ahead of his time with a Basque version of the scrum cap. My good friend Jean-Paul, who grew up in Béziers-once upon a time a French power, now in the lower divsions, sent me a couple of great out of print books that have some classic pictures. I will see if I can download them. Thank you Gentlemen for all these kind comments ! I'm always happy to "meet" and share with other "rugby geeks" (sic) all other the world ! I have been fascinated with Frederic's photos for well over a year myself, and have even "stolen" some of his images for my desktops.